Tangled Breaks are very pleased to announce Bushwacka! (Just Be) to play the 20th anniversary party. Matthew (Bushwacka) B will be playing an exclusive Plank records breakbeat set, incorporating everything from old skoool electro, Bushwacka breaksbeat classics and brand new material. Bushwacka! 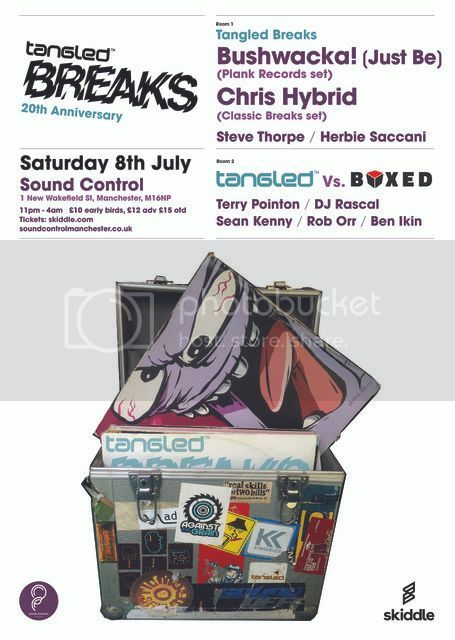 breakbeat tunes have been a hammered by all the big players on the scene over the last 20 years and it is a real honour to have him finally perform for Tangled Breaks after all these years. Alongside Bushwacka is Tangled favourite Chris Hybrid playing a quality classic breakbeat set in his own unique euphoric style. Joining Steve will be Tangled Breaks original resident and Moovin festival founder, Herbie Sacanni spinning a mix of breaks and beats that shaped the sound of Tangled Breaks. Room 2 is hosted Tangled founder and resident Terry Pointon. Joining Terry will be Tangled resident, DJ Rascal and one time Phoenix resident Sean Kenny alongside Manchesters Boxed clubnight DJs, Rob Orr and Ben Ikin, who also frequented Tangled at the Phoenix back in the day. Room 2 is basically a Phoenix reunion, bringing together all those people who met and raved at the legendary club all those years ago. I would be all over this were it not for FreeRotation. Would be amazing to see Bushwacka!